MS Backup files .BKF are created to backup all valuable files and folders, so that in times of corruption the bkf file could be used to restore all lost files and folders. Windows’ NTBackup utility is used to create BKF files for backing up the data. But what will you do if BKF file itself gets corrupt? Trouble must say. Backup files are the only option for restoring inaccessible or deleted or lost files. And when BKF files play spoilsport, the situation worsens. Consider a situation when you try to restore your files from existing BKF file. But, you notice that the files are not getting restored properly instead you encountering error messages. In short, backup file is not able to provide with restoration of backed files & folders. However, this situation is best tackled with BKF File Recovery tool, which repairs corrupt BKF files. Let’s have a look at the reasons behind inaccessibility of .BKF file. A third-party backup software has set the below mentioned value to 1 while getting installed. But, the NTBackup utility sets it to 0. Another main could be missing files from the .BKF file. This happens when the value of the above mentioned entry is set to 0, the backup utility skips the open files, as a result of which some files might be missing while restoring from the .bkf file. For resolving this issue, you need to set the following value to 0. Secondly, make sure that the file is consistent before you backup. NTBackup is a simple utility that is built in with Windows 2000, Windows XP and Windows Server 2003 Operating Systems to back up and restore data. Microsoft, the developers of Windows has replaced NT Backup with another utility named Windows 7 File Recovery (or Windows Backup and Restore Centre) in later version of Windows. And in Server Operating Systems starting from Windows Server 2008, a facility named Windows Server Backup has been introduced for backing up and restoring data. When you need to backup data or needs to restore data from backup, you can open this tool through Accessories > System Tools from the Start Menu of the Windows. 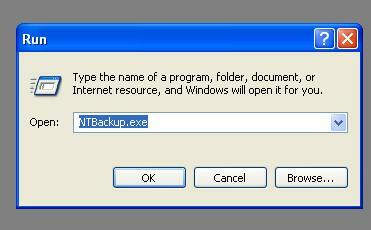 Alternately, you can run ntbackup.exe in the Run prompt or Command line. NTBackup utility saves files to disks, tape drives and ZIP drives in BKF format and restores files from the backup when required. Sometimes, when you try to restore the data from the NTBackup, you may receive the message ‘The backup file contains unrecognized data and cannot be used.’ And you won’t be able to access the back up the files. It means that your backup files are corrupt. Then how can you restore your data? Backup file corruption can happen due to many reasons such as: issues with ownership, mapping or permissions, and accidental system shut down at the time of backing up the data or accessing the data. It can happen due to the deletion of archive bit also. On Windows, when a file is created or modified, a file attribute named ‘archive bit’ is set. And when the file is backed up, the archive bit is cleared. Thus by looking at the status of the archive bit, one can say whether a file is backed up or not. Sometimes archive bit may get deleted due to some problems such as corruption, virus attack or some other error. In that case you won’t be able to restore backup files backed up by the NT Backup. Alas! What could be the reason behind this? How did the back-up file get corrupted? Probably, the reason which damaged the original data could have also affected the backup file. But now what? How will the data recovered? Need not worry; there is a way out even for this adverse situation. Commercial backup recovery software can easily recover the corrupted backup files. All you need to do is, choose appropriate backup recovery software which suits best to your requirements. An individual who depends on computer for either professional or personal work knows the importance of backing up the data. Maintaining a back up and safeguarding the database is very important since any mishap such as virus attack, accidental system format, etc does not knock the door of the person before arriving. Therefore, as a prevention measure professional individuals follow the practice of creating back up file (BKF) on daily basis and the personal users do it on a regular interval of time. On any random day, imagine the situation that you somehow loose your computer data. When attempted to access the backup file unfortunately you last up encountering that it is not getting accessed. All the efforts put in by you appears to go in vain despite of taking the prevention measures. The reason behind this acerb fact is that BKF file is also prone to corruption or damage just like any other data file. The probable reason of such error could be that the media being used is in an unmountable state which is not allowing the user to recover the data or the BKF file has gone corrupt. It is generally seen that when the BKF file gets corrupt the character in the file turns to non-readable form or the BKF file does not open or the database in the BKF element cannot be displayed. In order to avoid BKF file corruption, it is recommended that if the system is virus infected then attempt should not be made to install the file from BKF, antivirus of the system should be up-to-date and any file downloaded from the internet should always be scanned. As insurance saves our lives from sudden disastrous loss, backup also helps in compensating the loss of system data from fatal data disaster. Users can get instant relief from the pain of losing important and crucial system as well as personal data if backup is available. But situations turn cumbersome when backup files become lost from Windows operating system. Users often face the problem of backup file corruption which restricts them from accessing the backup files. Suppose, you have been creating an incremental backup on an external hard drive. Recently you found that your computer has crashed and you reinstalled fresh operating system. After this updation, you tried to restore the backup files from external device to Windows. With Advanced Restore option, you find all the backup files. But when you tried to actually restore the files, it refused to do so with an error “The backup file could not be found. Check your hardware configuration or restore from a different backup (0x8100001A).” You check the permissions and find nothing causing this error. The backup restoration process finds the backup files when you click ‘Add Folders’ option, but it doesn’t restore your data.